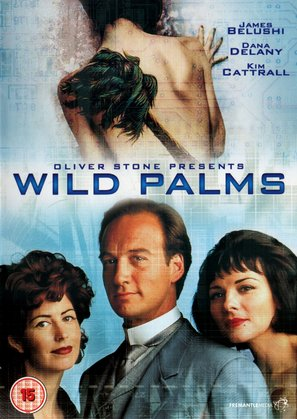 The DVD release of Wild Palms is a sparse thing. There are no extras, no deleted scenes, no commentary track, no language options, not even any subtitles. It’s like for the DVD release they digitised the episodes, slapped them on two discs, designed some cheap packaging and tossed it out there. They even made a mess of the packaging – the copyright notice on the back and on the two discs reads “copyright 1969 ABC Films” rather than “copyright 1993”, which is when the show actually aired. You can’t even select any scenes within the individual episodes – even though they are actually split into chapters, there’s no scene-selection menu, just an option on the menu screen to pick an individual episode or just play them all. This is, in short, the most-bare bones DVD release I’ve ever seen – it’s from 2008, but I don’t think I’ve ever seen such a sparse offering, even on DVDs released whilst the World Trade Center was still standing and whilst Clinton was still President. It’s almost as though nobody involved in the release could be bothered to make an effort – or nobody involved in the show cares to revisit it.